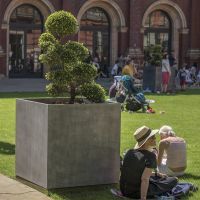 Bespoke Zinc planters were commissioned for the John Madejski garden, at the heart of the V&A Museum in London. The 22nr. Tree Planters of L/W/H 1000mm were manufactured from 2.0mm Zintec Steel with a Polyester Powder Coated [PPC] finish, clad with 1.2mm Zinc sheet. The Zinc cladding was pre-patinated by IOTA, and will continue to age naturally. The planter concept and design was by Dmitri Martin Associates [DMA], with manufacturing design detailing by IOTA – which included provision for lighting; removeable trays to retain mulch; plus adjustable feet, irrigation system plumbing, and tree root ball anchoring.